We are closely monitoring Hurricane Michael and positioning crews and supplies so we can respond as soon as it's safe to do so. RICHMOND, Va., Oct. 11, 2018 /PRNewswire/ -- Dominion Energy is tracking and preparing for the potential that Hurricane Michael will cause power outages as it makes its way north. This powerful, fast-moving hurricane is expected to blow through the Carolinas and parts of Virginia Thursday evening into Friday morning, with tropical-force winds and torrential rain that can bring down trees and power lines. "We are closely monitoring Hurricane Michael and positioning crews and supplies so we can respond as soon as it's safe to do so," said Ed Baine, senior vice president – Electric Distribution. "We urge our customers to be ready, have an emergency plan and use an abundance of caution in the aftermath of this potentially dangerous storm." Customers are urged to prepare now for a strong storm that could bring dangerous conditions, flooding, and widespread outages. 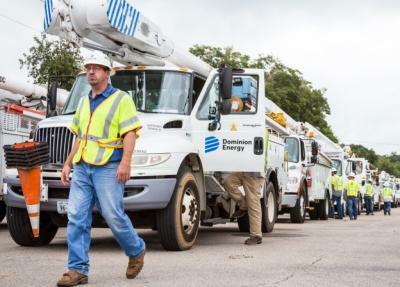 The company is staging crews and materials ahead of the storm so it can be ready to assess damage and restore power as soon as weather conditions are safe. Set up an online account to easily report and track power outages from any mobile device. Bookmark our website, DominionEnergy.com, on your mobile device to quickly report outages. If you have a generator, be sure it is fueled, tested and properly connected. Follow the manufacturer's instructions and always operate out of doors with good ventilation. Always report your outage by visiting https://www.dominionenergy.com/outage-center/report-and-check-outages or calling 1-866-DOM-HELP (1-866-366-4357). Turn off all appliances except one light to prevent overload when power comes back on. Be careful to avoid downed power lines, which may be energized and deadly. Remember that downed wires can be hidden under fallen trees or branches or under flooded streets or yards. Stay at least 30 feet away and make sure your family, pets, and neighbors avoid downed wires. Call 1-866-DOM-HELP (1-866-366-4357) and stay on the line to speak with an agent so we can make the area safe.